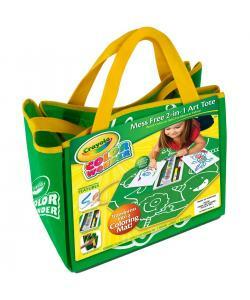 With the Crayola Mess-Free 2-in-1 Art Tote, you'll never have to worry about misplaced markers or paintbrushes again! It's like a mini art studio that's always ready to use when the craft bug bites. The tote itself becomes part of the fun too, becoming a perfect flat space to create with paints, paintbrushes, markers and Color Wonder paper. Using the tote as a mat also makes cleanup super easy. Everything stays together and tucks quickly back into the tote when art is finished for the day. Let the kids doodle as much as they want without worrying about paint and markers making a mess. The Color Wonder markers and paints appear only on Color Wonder paper, ensuring that your walls, floor and furniture stay nice and clean. The Color Wonder paper works with all Color Wonder markers and paints, so you can add colors from other sets to the tote for even more creative fun. 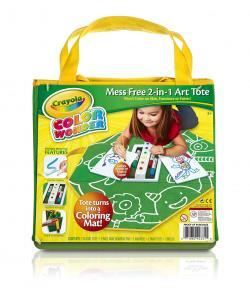 The Mess Free 2-in-1 Art Tote comes with 6 Color Wonder Paint Pots, 1 Paintbrush, 3 Markers and 1 20-page Mini Drawing Pad. 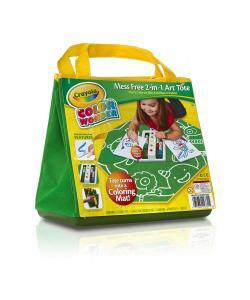 This handy carryall unfolds into a large art mat, complete with Color Wonder Paper, Paints and Markers! Clean up is a snap too! Just lift the handles and sides to change back into a storage tote with all your Color Wonder goodies inside. Includes Color Wonder Paints, Paintbrush, Markers and a 15-page mini pad of Color Wonder Paper.